Jeff Heinen receives a proclamation from Mayor Michael Dylan Brennan. Heinen’s story began in 1929 when local butcher Joe Heinen pioneered the city’s first supermarket by selling traditional grocery items alongside hand-butchered meats. 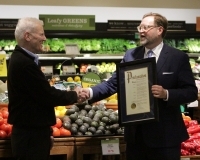 Bringing these two shopping experiences together was revolutionary in the grocery industry, but what truly set Heinen apart was his commitment to quality. Throughout 2019, Heinen’s will host special anniversary sales and events to thank its customers for their decades of loyalty.